This is a 2.2 µm image of Amalthea from the Infrared Camera and Spectrograph on Subaru telescope. (2002/12/10 12:49 UT; 5 sec exposure). Amalthea is the bright object in the lower left corner and Jupiter occupies the upper half of the image. 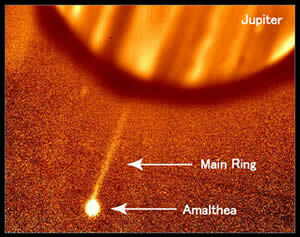 The straight streak between Jupiter and Amalthea is Jupiter's ring seen edge-on. Image credit: Subaru Telescope, National Astronomical Observatory of Japan. Planets like Earth and Jupiter formed from the disk of gas and dust swirling around the Sun at the time of its birth. Rocky planets like Earth formed in the high temperature environment close to the Sun, while large gaseous planets like Jupiter formed in the cooler regions farther away. Similarly, Jupiter, the largest planet in the solar system, probably had its own disc of gas and dust. The four moons of Jupiter discovered by Galileo (Io, Europa, Ganymede, and Callisto) are likely to have been born from this disk. The origin of the four small inner moons remain a mystery, however. They have orbits compatible with the hypothesis that they formed in orbit around Jupiter like the Galilean moons. On the other hand, their small irregular shapes and their comparatively low reflectivity and low densities resemble asteroids and suggest that they were captured by Jupiter's gravitational pull just like the outer moons. The mystery persists because of the challenge inherent in observing Jupiter's small inner moons from Earth. The moons are small and therefore faint, and they are obscured by the bright glare from Jupiter. Although NASA's space probes Voyager and Galileo have captured detailed images of Jupiter's small inner moons, these data have been insufficient for resolving the question of their origin. Naruhisa Takato from the National Astronomical Observatory of Japan and his collaborators have now had success in obtaining the first infrared spectrum of two of Jupiter's small inner moons, Amalthea and Thebe. To obtain a spectrum over a wide range of infrared wavelengths, the group combined the strengths of two instruments on two telescopes on the summit of Mauna Kea, Hawaii. For high resolution spectroscopy at wavelengths longer than 3 µm ,the group used the Infrared Camera and Spectrograph on the Subaru telescope. For shorter wavelengths, the group used SpeX on the NASA IRTF, which has broad wavelength coverage. The new spectrum of Amalthea shows the characteristic signatures of water. The most likely location of this water is within water containing hydrous minerals. Such minerals typically form in low temperature environments, ruling out the possibility that Amalthea could have formed in the high temperature environment of Jupiter's immediate neighbourhood while the planet was forming and where Amalthea now is. If Amalthea did not form near its present location, where did it come from? The surface of Amalthea resembles regions of Callisto that are not covered by ice. This suggests that Amalthea may have been one of the many small "micro-satellites" orbiting Jupiter that was sucked into an inner orbit when the Galilean moons formed. However, the spectrum of Amalthea has similarities with asteroids orbiting the Sun, suggesting that is was a "micro-planet" that was pulled into Jupiter's orbit when Jupiter itself was forming. Takato says "although we think Jupiter's moons formed as an assembly of many smaller bodies, the same way we think planets formed from 'planetesimals', until now we have not found any example of the original building blocks of a planet's moon. However, our results strengthen the argument that Amalthea is one of the few remaining pieces of the material that formed the Galilean moons. Amalthea may have ended up in orbit close to Jupiter rather than get incorporated into a larger moon or Jupiter itself. If this is the case, Amalthea would be the first known example of a 'satellitesimal.'"